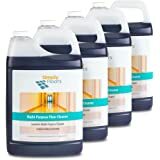 Buy this product Renewed and save $5.36. 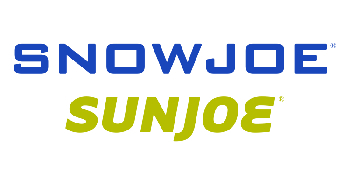 Snow Joe + Sun Joe specialize in developing innovative outdoor tools to keep your home looking beautiful throughout the year, whether the snow is falling or the sun is shining. 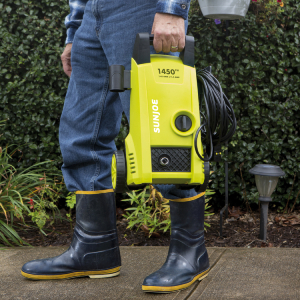 Our expansive line of outdoor power equipment, which includes manual, cordless, and electric tools such as lawn mowers, trimmers, tillers, and snow blowers, aims to simplify your yard routine to make it quick and easy to get your outdoor chores done. 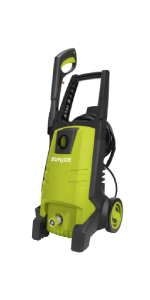 The SPX1000 is ideal for tackling a variety of light-to-medium duty cleaning jobs. 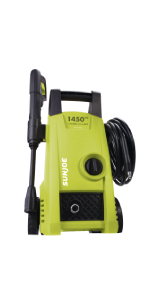 Sun Joe delivers up to 1450 PSI of cleaning power and a maximum flow rate of 1.45 GPM, which means you’ll get your cleaning chore done faster and easier with less strain and fatigue. 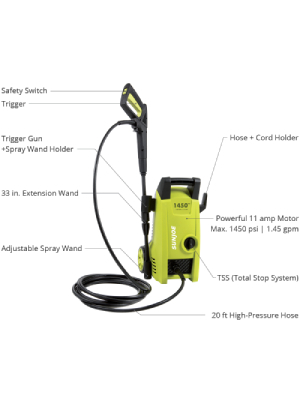 Extend your cleaning reach with its 33-inch wand, which features an adjustable spray nozzle to easily change the water pressure from an intense, zero-degree jet spray to a gentle, 45-degree fan spray. Safety features include a trigger safety lock with TSS (Total Stop System) technology and a complete on/ off switch. 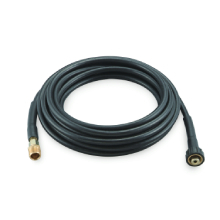 Pressure Joe's 11.5 amp motor can generate up to 1450 PSI and a maximum flow rate of 1.45 GPM. 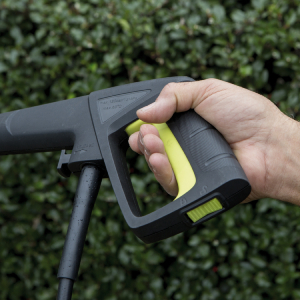 Adjustable spray wand can go from zero-degree pencil point jet to a 45-degree fan spray. Safety features include a trigger safety lock with TSS (Total Stop System) technology and integrated safety lock prevents trigger from accidentally engaging. 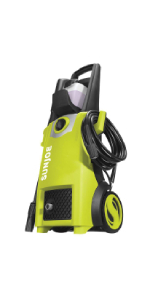 Lightweight and compact so you can easily tote or wheel it from one cleaning task to the next. 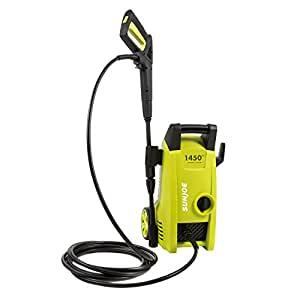 Ive never owned a pressure washer before and finally, the need for one arose. There are many options to choose from, and i was searching for an 1100 psi compact electric unit. This one just happened to have a bunch of good reviews so i got it. Its a great little basic machine. 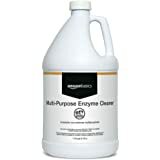 Used it to clean off the deck and underside of a car. I was impressed. 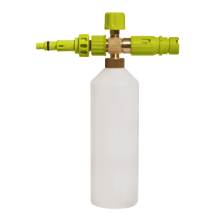 The pressure nozzle has an adjustable beam, from basically a needle to a fan spray. The pump only runs when the trigger is depressed, thus saving the motor some life. And its pretty compact. Directions are ok, but its relatively intuitive to set up and get cleaning. Be advised, this is not an industrial machine: make sure you get what you need. But if youre looking for a deccent quality, small, affordable unit, id say give this little guy a try. 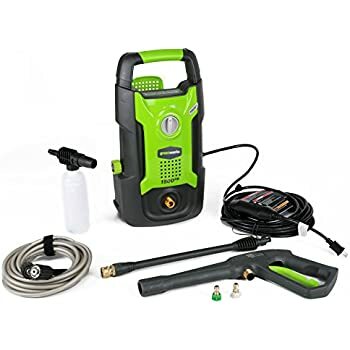 Its less than $100 and cranks out water at 1400psi. Not too shabby. 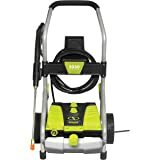 3.0 out of 5 starsAn inexpensive pressure washer. 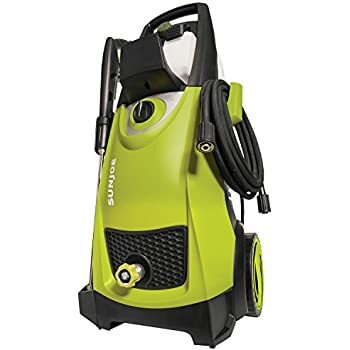 This plastic structure of this pressure washer is fragile. Both wheels have already broken off, and repairing them now is not worth the larger effort. 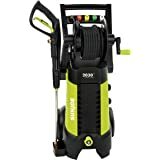 So, I can no longer roll the pressure washer ... and instead just lug it around. 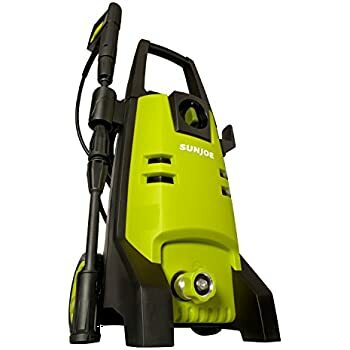 I am keeping this pressure washer. It will complete the task at hand which I primarily purchased it for (e.g., painting the house). SO ... if you want something that is consistently unbreakable, longer lasting, easy to move around, has higher end features like a quick release hose ... I would now suggest looking elsewhere or at a more expensive model of this brand. 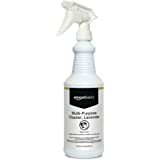 4.0 out of 5 starsAnother good Sun Joe product. I have only used this a couple of times so far and it seems quite good. 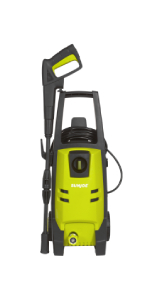 I have purchased other Sun Joe products which I have been very pleased with so I expect this to also work well. 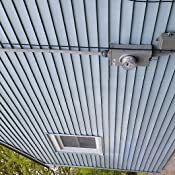 Addendum: I have used this little washer on my house and on my garage. It is slow but did the job. 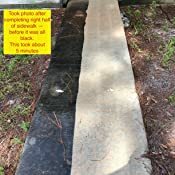 It hadn't been used for a while because we had a lot of rain but I needed to clean the floor in my garage work room and figured this would do a good job. Plugged it in and . . . nothing. It had been too long for warranty protection so I figured it must be a loose wire because all else looked good. I opened the electronic plug and water came pouring out of it. This should have been a sealed plug but apparently it wasn't. The inside was rusty and a capacitor had broken off. I emailed the company to see if I could buy a replacement plug. It took a couple of tries before I got a response but they said I couldn't buy a plug. Instead they asked me to fill out the registration for the warranty (I had not registered it when I bought it) and they would send me and entire replacement unit! I received the new unit in a few days and will now box the old one and send it back to them. This was far beyond the customer service I had anticipated and restored my faith in this company. 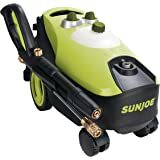 I have a few other Sun Joe products and for light weight small jobs they work surprisingly well. The chipper/shredder has been a great little work horse for small branches and cuttings. I even bought two thinking it was so inexpensive it wouldn't last and even after a few years the 2nd unit remains in the sealed box. I should say these tools are NOT meant for heavy duty work but if you need it for casual and occasional cleaning it will do the job. 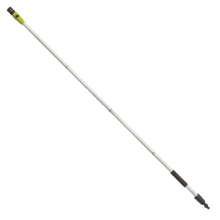 4.0 out of 5 starsWell engineered, convenient wand, powerful enough for small jobs. Very well engineered product. 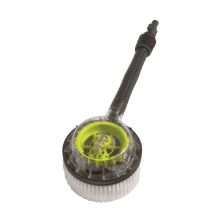 The spray wand is very convenient and well designed to swap out attachments very easily and conveniently. The power of this unit is adequate for small jobs. 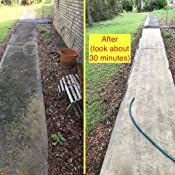 I cleaned an outdoor tile patio (700 sqft in about 45 minutes) and a sidewalk (about 25 minutes). 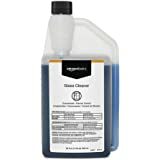 I also got the 10" surface cleaner and, for the money, its a good value and a must for this washer. 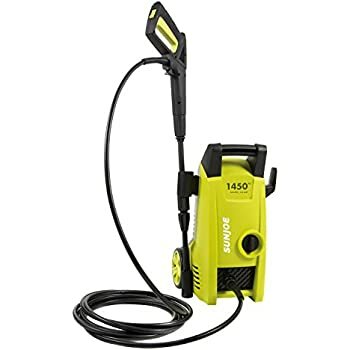 I was concerned 1450 psi would be under powered for the surface cleaner, but if you're patient and don't have a lot of are to do, it does a pretty good job, albeit a tad streaky compared to much more powerful systems. I really like the adjustable nozzle for tight jet stream all the way to wide fan. Very convenient! 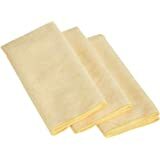 I also cleaned a couple of medium sized screened areas and it did a great job one the screens. And it can removed mud dobber nests quite well with the nozzle tuned to jet stream. For what this is, its great. 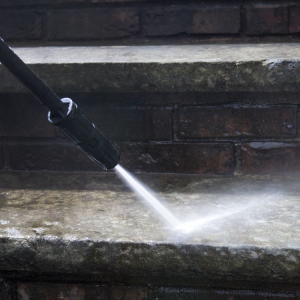 I'm really old and pressure washing the whole North side of my house nearly killed me but this thing did the job. 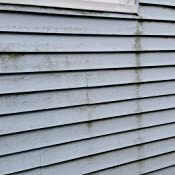 I've got a Gas engine powered pressure washer but jerking on that starter rope wore me out before I even got to the washing part. I probably should have ordered the soap dispensing attachment but I didn't. 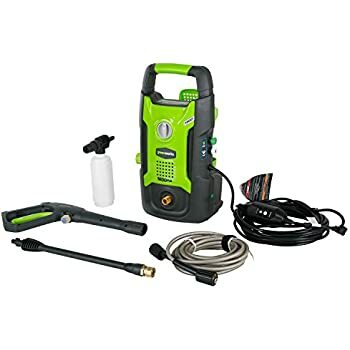 This thing cost less than what a fellow offered to pressure wash my house. Of course, he would have done all 4 sides even though I only need to do the North side each year. I plan to try it out when I wash the cars. If I soap them up and use this to pressure rinse, they should come out looking great. By The Way..... These aren't Industrial Quality so don't expect it to be.